One of my favorite parts about spring here in Texas is getting to see all of the wildflowers blooming. 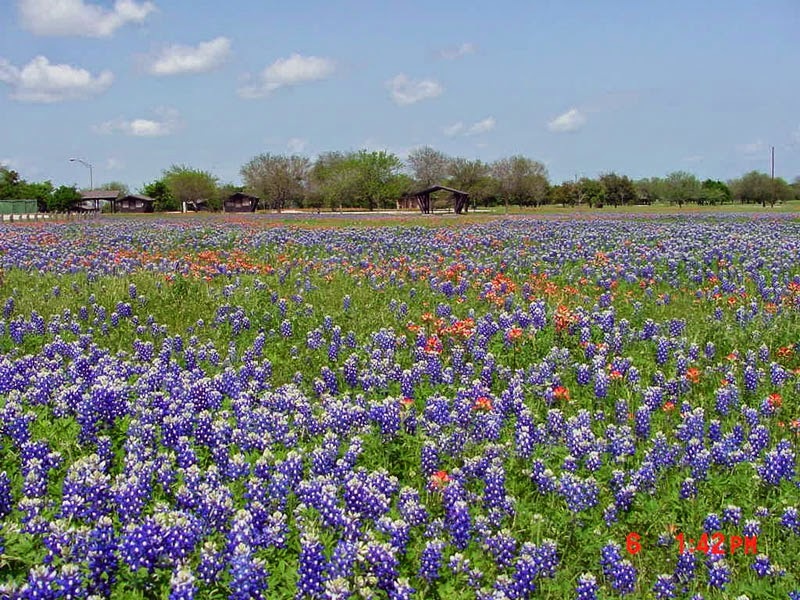 Our state flower is the Texas Bluebonnet and for good reason too, those things pop up everywhere. We even have some in our backyard at our new house. It's so cool to see fields that are normally covered in green grass transform almost over night into a sea of blue. It was a fairly quiet week for my portfolio as the markets ended the week higher. There were a few days where it looked like the markets would give up some ground and unlock some more value but that just wasn't in the cards for this week. Since we're in the middle of earnings season there's still plenty of time for some more volatility and some negative earnings surprises to turn the markets south for a bit and I'm ready and waiting for that to happen. Kinder Morgan, Inc. announced an increase in their dividend from $0.41 to $0.42. Since I own 218 shares of KMI that increased my forward dividends by $8.74. Even better news is that they reaffirmed their target payout of $1.72 for 2014 which means more increases should be coming as they've only paid out $0.83 including the latest announcement. When the markets seem a bit frothy I try to either just stop paying attention to them or start researching investment ideas and updating my valuations on companies. I received a request to do an analysis on Family Dollar Stores, Inc. and while I like the company it seems a bit pricey given their current struggles. I was very surprised to find out they had a 38 year dividend growth streak. I didn't get much writing done on some other analyses but I did grab the latest data for some of the consumer staples companies and I hope to get a bunch of writing done this weekend and early next week. Thanks again to everyone that stopped by, commented, or shared posts from Passive-Income-Pursuit this past week. I truly appreciate it and can't thank you all enough. Also, be sure to not miss any posts from here by signing up to receive them to your email here or at the Subscribe page. My First Stock Investments by Roadmap2Retire - Before you start to invest in individual companies you need to commit yourself to a constant learning process. Oftentimes are biggest and worst mistakes come from when we first start out as we aren't really sure in our decisions or thought process. I know I made my fair share of mistakes and will continue to do so in the future. However, that thought process will improve as you learn what works best for you and how to better analyze the moats/operations of companies. Financial Independence: More Debt for Less Freedom by Financially Integrated - Congratulations go out to Financially Integrated for getting to $50k in forward passive income. That's a great accomplishment. Although he has some concerns about his debt level in doing so, specifically with financing the purchase of their new house. I understand the concerns because it's hard to swap from having almost no debt to all of a sudden being hundreds of thousands of dollars in debt, but I think his whole family will be much happier. Investment Income Update - April 15, 2014 by Retire Before Dad - Even though it was a light month for dividends, he's knocking it out of the park with over $4,300 in forward annual income. That's almost $360 per month! Which Businesses are Worth Your Cash? by Income Surfer - While most of us love investing in some of the greatest companies with reaches all across the world, what about investing in a business just a few blocks from home? Bryan talks about some of the risks associated with investing in local small businesses. It's an idea that I've thought about for my post FI life because I think it'd be pretty fun to run my own business. Of course that's still a few years away and I've got lots of other ideas too. Why I Only Buy Companies that Consistently Pay and Raise Dividends by Dividend Mantra - There's a long list of reasons to buy companies that have the ability to pay and also increase their dividends year after year, decade after decade. One of the best things about companies that can do so is that they have wide moats that are hard for competitors to get in to. Over the short term you can use some financial trickery to keep a rising dividend in tact, but when you stretch that out to decades long streaks you're talking about some very high quality companies. Should I Sell my Walgeen's Stock? by Dividend Growth Stock Investing - One issue that I've dealt with myself and I'm sure runs across the mind of just about any dividend growth investor, is whether to sell a company that has shown great capital appreciation. Make sure that you're accounting for everything including all of the frictional costs such as taxes, commission to both sell and buy a new position. Unless the company is so grossly overvalued, think Coca-Cola all of a sudden trading for 30 times earnings I try to stay away from selling for diversification purposes while in the accumulation phase. Financial Matters by A Wealth of Common Sense - Too often it's easy to get caught up in everything except the right thing that will truly make a difference with your finances. If you follow the financial world at all there's always some breaking news story that is going to send the markets skyrocketing to the moon or plummeting to the depths of the ocean. It's important to take a step back and focus on the things that you actually have control over rather than worry about things that you can't change anyways. Investing Isn't Very Exciting...At First by FI Fighter - The road to financial independence often gets started with a bang as it's something new that you're pursuing so you have all the motivation and enthusiasm pushing you along. But it gets to the point where you're grinding away as a your financial house is in order and just continue investing along the way. That's when the boredom, or complacency rather sets in, and things seem to not be moving nearly as fast as you would like. Eventually though you'll reach an inflection point where the compounding and passive income will really take off. That's when you've got it made. Our Treasure Chest Reward System for Kids by Brick By Brick Investing - Sometimes it's hard to strike a balance between giving your kids what you didn't and instilling them with the tools they need to life a financially prosperous life. My wife and I don't have any kids yet, but I've been thinking about ways to teach them about personal finance. Marvin came up with a great idea to start the process with his daughter while she's young and it's something I'll be considering when my wife and I do have children. Although extra practice is always fun! How to Monitor Your Dividend Investments by Dividend Growth Investor - The preferred holding period of almost all of my fellow dividend growth investors is forever. However, that doesn't mean we can blindly hold the company without monitoring a company's performance. You must remain diligent and come up with a plan for how you will assess the health and future prospects of the companies that you own. My Financial Journey by Invest Like Grampa - I always find it interesting to see what leads people towards wherever they are currently at. More often than not it's a bunch of little things along the way that keep planting the seed until one day it all comes together. I hope you all have a great weekend! I should be heading home on Sunday and I can't wait. Photo Credit: GeekPhilosopher: Instant download of free stock photos, images, backgrounds, and desktop wallpapers. Pictures can be used for personal and commercial web sites. Thanks for including my post, JC. Appreciate the support. Have a great weekend. Thank you for including me as well PIP! Based on projections, it looks like KMI will pay out something like 44 - 45 cents/quarter by the end of 2014. Not too bad if you ask me. Thanks for the inclusion JC. I appreciate the support and hope you dont work too hard this weekend. Thanks for the mention JC! Those blue bonnets are beautiful! I'm from Texas too and see them around the Lake I ride around! Thanks for the mention! Hope you had a great weekend and got to enjoy some sunshine! Thanks for the mention JC. I really had a great time building that chest with her.